I’ve been pursuing some new creative avenues. 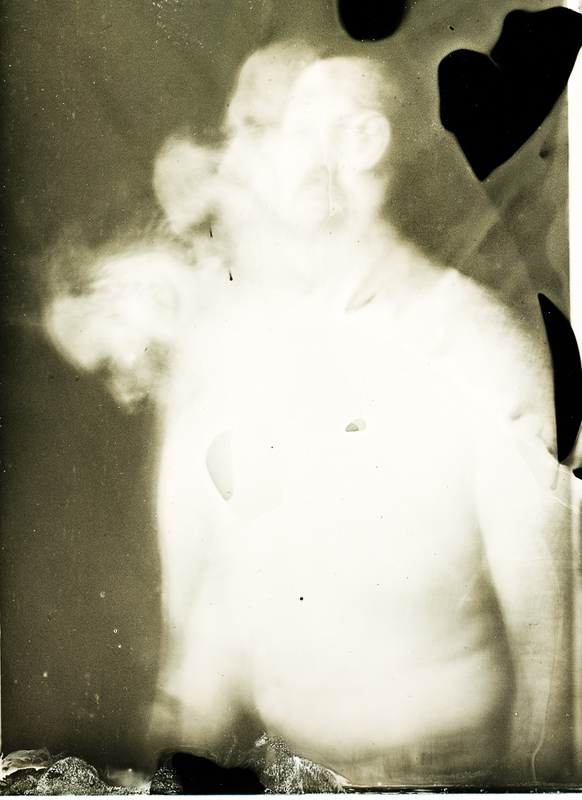 So there is a good reason why there are so few selfies from the wet plate collodion era! Somehow, I managed to do muck up just about everything here, including tearing the emulsion. Yet it still looks interesting to me! A lot has changed in the last year. I changed jobs, we moved to another state, I moved into a new art studio and I have completely changed up my creative process. Yet somehow I managed to go a year without posting anything to this blog! Well, let’s change that. At the end of 2016, I was feeling sapped creatively. Oddly enough, this came at a time of great productivity for me. I had a solo show of my work in at Manifest Gallery in Cincinnati and it was getting decent recognition. Moreover, I had experienced an epiphany about the work, or rather what was driving me to create it. And therein lay the problem. Once I understood the underlying motivation of my creative urge, it was hard to let that urge live on its own. It needed space to work, but now my conscious was getting in the way. I felt a little lost. Combined with the big life changes, my work languished. 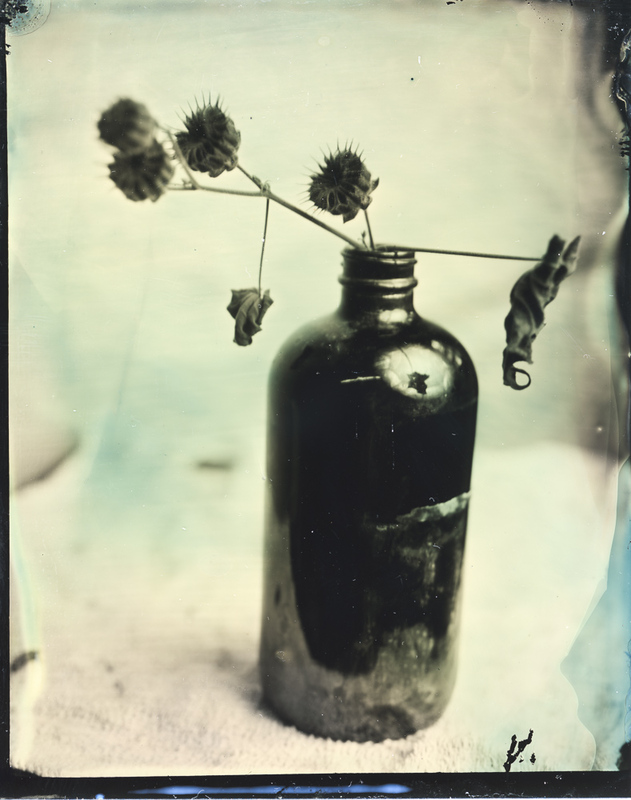 Somewhere along the line I took an introductory half-day workshop on the wet plate process. 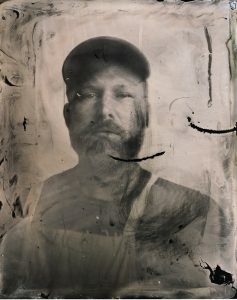 Wet plate is a nineteenth century photographic process where nitrocellulose collodion is poured over a glass or metal plate, sensitized in silver nitrate, then exposed and developed while wet. It’s a mix of art, chemistry and chance. I was in love! I went on to take an in-depth workshop with John Coffer (post here), a true master of the technique, and am now back in my studio with it. I neglected to fully rinse the developer off of the plate, so the remaining ferrous sulfate reacted with the KCN fixer to make Prussian Blue- hence the tint. Kinda neat, for a mistake! What I love about wet plate is the process slows everything down. In an always on, instantaneous world, it is a deliberative, meditative work of creation. And that slowness lets me see things that were invisible before. Recent experimentation in time travel. Misson failure. With exposures ranging from seconds to minutes, the images are not just snapshots, but are an accumulation of the subject’s existence. Plus the final product is one of a kind. Everyone can see an Instagram post, but only one person can hold one of these tintypes. It becomes truly personal.